The subject of Angular testing is vast, as it’s a complex and very involved topic. It would require several chapters or a full-length course to cover it fully. So in this guide, I’ll show you just the basics to get you started. At the time of writing, Angular 5.2 is the current stable version — which is what we’ll be using here. This guide assumes you at least have a solid grasp of Angular 4+ fundamentals. It’s also assumed you at least understand the concept or have some skills writing automated tests. We’ll base our testing examples on Angular’s official beginner tutorial to demonstrate how to write tests for components and services. You can find the completed code with tests on our GitHub repository. At the end of this guide, you should have the skills to implement several passing tests in Angular 5. As you already know, an Angular project is made up of templates, components, services and modules. They all run inside what’s known as the Angular environment. While it’s possible to write isolated tests, you won’t really know how your code will interact with other elements within the Angular environment. Luckily, we have several technologies that can help us write such unit tests with the least amount of effort. We’ll look more closely at what’s going on here a little further below. The anatomy of a Jasmine test is made up of at least two elements: a describe function, which is a suite of tests, and an it function, which is the test itself. We normally use describe to indicate the function we’re focusing on — for example, createCustomer(). Then, within the suite, we create multiple it tests. Each test puts the target function under a different condition in order to ensure it behaves as expected. You can refer to the Jasmine docs for more information. In order for Karma to run your tests, you must ensure the test files end with .spec.ts. 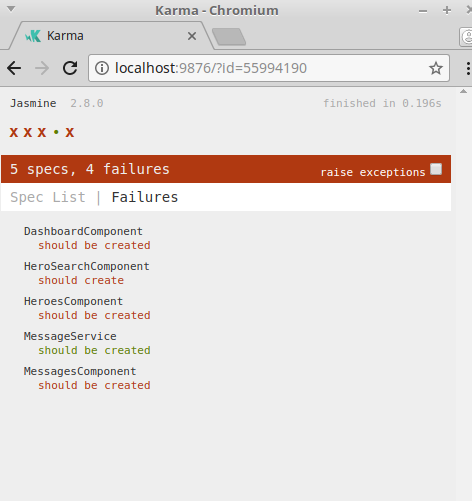 You should note that Karma was designed to mostly run unit tests. To run end-to-end tests, we’ll need another tool, Protractor, which we’ll look into next. You can find the documentation for its configuration here. Unlike Jasmine/Karma tests, Protractor tests are located outside the src folder, in a folder called e2e. We’ll look into writing end-to-end tests later down the road. For now, let’s start writing unit tests. These tests get created when you generate components, services and classes using the Angular CLI tool. At the point of creation, the code in these tests were correct. However, as you added code to your component and services, the tests got broken. In the next section, we’ll see how we can solve the broken tests. In the first beforeEach() function, we’re using the TestBed.configureTestingModule function to create a module environment for testing the component. It’s similar to NgModules, except that in this case we’re creating a module for testing. In the second beforeEach() function, we create an instance of the component-under-test. Once we do this we can’t configure the TestBed again, as an error will be thrown. Finally we have the spec, should be created, where we confirm that the component has be initialized. If this test passes, it means the component should run properly within an Angular environment. However, if it fails, it’s likely the component has a certain dependency we haven’t included in the test configuration. Let’s look at how we can deal with different issues. That should fix the issue with the FormsModule. However, there are a couple more dependencies we need to specify in our test environment. Notice we have a directive called routerLink. It’s a directive provided by AppRoutingModule library. If run the dashboard test, it will fail due to this dependency. To fix it, just implement RoutingTestingModule in dashboard.component.spec.ts the same way we’ve done for hero-detail.component.spec.ts. 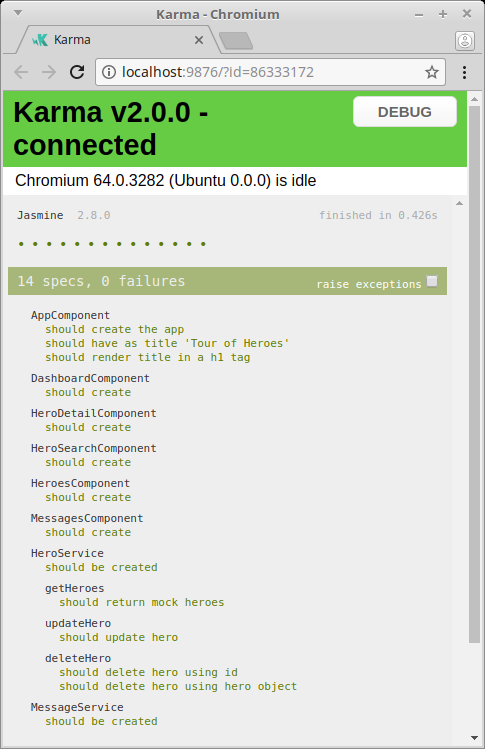 Let’s now look at how we can test components that depend on services. We use the providers option to inject the MockHeroService as our service. Implement this for all components’ test code using the service. Now that we’ve dealt with some of the common scenarios that occur while testing components, let’s look at how we can test services. Services perform the core logic of our applications, so it’s very important we test their functions thoroughly. As mentioned earlier, Angular testing is a deep subject, so we’re just going to scratch the surface here. // After every test, assert that there are no more pending requests. This is just a sample of how we should write a test for a service that interacts with the HttpClientModule. Examine each test and take note that we’re using HttpTestingController class to intercept requests. In this test, we’re controlling the inputs and outputs to create different scenarios. The main purpose of these tests is to ensure that our service methods are able to handle each scenario gracefully. Note that we haven’t fully implemented all the tests required for hero.service.spec.ts, as it’s beyond the scope of this guide. There are more topics that we still need to look at before the end of this guide. Unit tests ensure components and services run correctly in a controlled test environment. However, there’s no guarantee that components and services will interact with each other within the Angular environment. That’s why we need to perform end-to-end testing. An end-to-end test is one that simulates human testing. In other words, the tests are designed to interact with our application the same way we do — via the browser interface. the hero can be deleted. And you can keep on adding to this list as more features get implemented. An end-to-end test ideally has two parts. - Expected 'Tour of Heroes' to equal 'Welcome to app!'. Watching e2e tests run is an awesome feeling. It gives you the confidence that your application will run smoothly in production. Now that you have had a taste of e2e, its time to move on to another cool testing feature. The above threshold value specifies a minimum of 80% to be covered by unit tests. We’ve now covered the basics of Angular testing. However, we can improve our code quality by going a few steps further. This command will spit out warnings about your code — for example, where you forgot to use a semicolon, or you used too many spaces. The command will also help identify unused code and certain mistakes in your statements. Using this command often will ensure that everyone in your team writes code using a consistent style. You can further customize the lint options in the tslint.json file. Currently, neither Atom nor Sublime Text have these features, while they’re built into VSCode. You only need to install the required language extension. The Intellisense feature lists options for you as you type your code. It’s like autocomplete but with a specific list of syntactically correct options. With this feature it’s hard to make a syntax mistake. You also get to see a function’s documentation, allowing you to see the return type and the required inputs. Visual Studio Code also has a proper error highlighting feature. It not only checks for syntax errors, but also ensures assignments have the right type. For example, if you try to assign an array to the result of an Observable function, an error will be highlighted for you. VSCode also has Angular extensions compatible with Angular 5. Having an IDE that checks your code for errors as you type is great for productivity. It helps you spend less time fixing errors that you would otherwise have made. 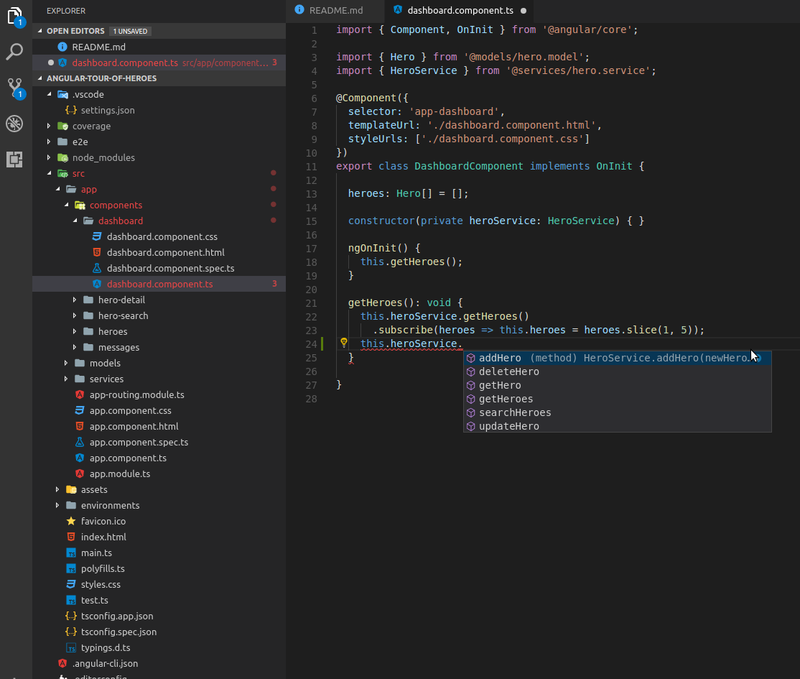 There may be other code editors that can accomplish the same, but for now I’m recommending Visual Studio Code for Angular projects. Continuous Integration (CI) is the process of automating testing and builds. As developers, we often work in isolation for a couple of weeks or more. 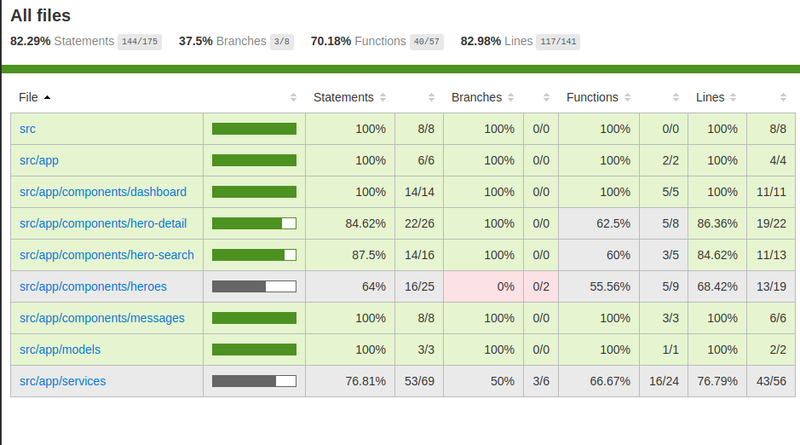 By the time we merge changes into the master branch, a lot of errors and conflicts are produced. This can take a lot of time to fix. CI encourages developers to write tests and commit tasks often in smaller bits. The CI server will automatically build and run tests, helping developers catch errors early, leading to less conflicts and issues. There are many CI solutions available for Angular developers. Check out SitePoint’s tutorial on testing Jasmine and Karma on Travis. Don’t write tests for a new application. The scope of the project will change rapidly, depending on what the client wants or how the market responds. Writing tests requires more time in addition to implementing features. It also requires time to maintain when the feature scope changes. If your budget is low, it’s okay to skip writing tests. Be practical with the resources you have. You’ve completed the prototype phase and you’ve pinned down the core features of your application. Your project has sufficient funding. Writing code that can be tested means you’re writing better quality code. As a developer, you’ll have more confidence releasing your latest version into production. Writing tests is a way of documenting your code. This means future developers will have an easier time upgrading legacy code. You don’t need to hire someone for quality control, as your CI server will do that work for you. If you decide to skip tests completely for your product-ready application, be prepared to face angry and disappointed customers in the future. The number of bugs will increase exponentially as your codebase increases in size. Hopefully this has been a useful introduction to Angular testing for you. If you want to learn more, I recommend you stick first to the official Angular 5 documentation. The majority of information out there is for older versions of Angular, unless stated otherwise. Let us know any cool tips you have on Angular testing!